Hardcover with jacket, 384 pages, 13.5 x 21.5 cm, 5.3 x 8.5 in. Edward Snowden has disclosed how closely intelligence services watch over our lives. Ever more details of their comprehensive espionage activities are being revealed almost daily. 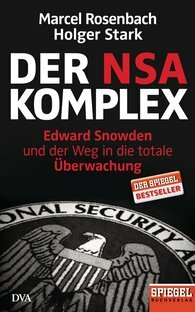 Spiegel authors Marcel Rosenbach and Holger Stark have been able to analyse large sections of the documents from the data bank of the NSA and British GCHQ made available by Edward Snowden and classified as "top secret". They discuss how the intelligence services in democratic societies have been able to become so powerful and why those responsible rejoice in internal documents that "the golden age of surveillance" has broken out. In their book, the two bestselling authors have revealed the true dimensions of a surveillance apparatus that threatens not only our private sphere but also the very foundations of democratic societies – and hence even those of us who have always thought they had nothing to hide. This book is an important contribution to the necessary international debate on the right balance between freedom on the one hand and, on the other, states promises of security in a digital age.